Looks like great value at £449.99 and cheapest around - also has a two year warranty, perfect for all my beer in the summer..
Also available in Silver for the same price. 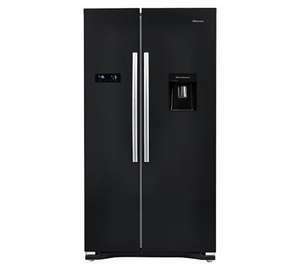 The Hisense RS723N4WB1 American Fridge Freezer comes in a high gloss black colour and has a large Net capacity of 556L to give you massive storage space. The model has an efficient A+ energy rating. This frost free fridge has a variety of functions such as super cool, super freeze and holiday mode to save energy. This side-by-side fridge freezer also has a non-plumbed water dispenser for chilled water. got one, door alarm needed new part, water nozzle failed after 5 months, and gets too cold! it froze me eggs! Deal posting newbie! This is rolypoley first deal post. Help out by leaving a posting tip or just to show your appreciation for their contribution.